Checking renders. The top shadow pass is flickery and fuzzy. The bottom one is not. This is a frame from a shot that is 150 frames long. The shadow pass took 4 minutes to render each frame. 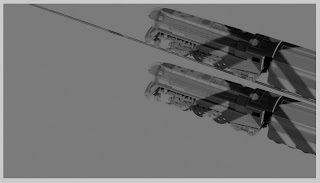 Since the top render was so lousy and since I forgot to turn off shadow casting for the rail, it had to be re-rendered. That's a 10 hour mistake. I'm fired.